These are shots Dan posted this week on his blog. This is a Shama bird, it's known for it's beautiful song. It was in our papaya tree singing it's heart out, and Dan got a shot. Dan and I were just having a discussion about the word pono. In Hawaii, words have multiple meanings, and it seems that it's meaning is the equivalent or close to, the Indian word karma. One meaning is rooted in personal accountability. For example, if you are in a bad mood, and you take it out on the waitress who may be slower than you’d like, she may be receptive to it and pick it up. Now she is in a bad mood, and every one of her customers feels it. Some may forget about her as the walk out the door. Others may take it on, and pass it on throughout their day. Maybe they get home, and the normal joy and energy of their three-year-old child is too much to bear. They may yell at the child, who will most certainly internalize it. This could naturally extend to everything: the way you take care of the land, water, air and animals. So being pono is being right with the world and your place in it. We did a story on 22 North, and this is one of the salads we got to sample! 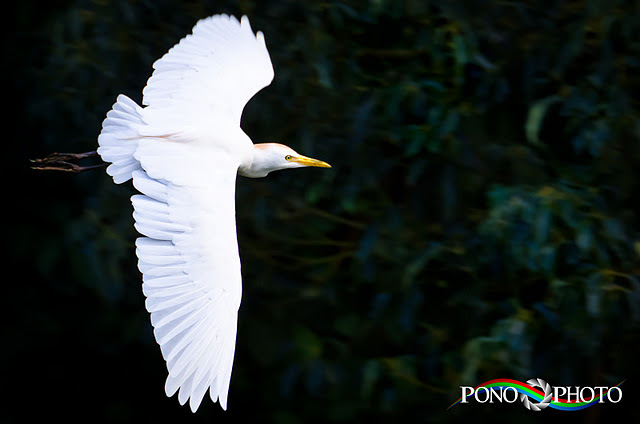 Another meaning of pono suggests going with the flow. Surrendering to life. Looking for open doors and going through them. Harmony. Following your dreams. Noticing and tapping into what feels good and following that. Having faith that, as long as your in the flow of life, everything will work out. Even better than you could have designed it. 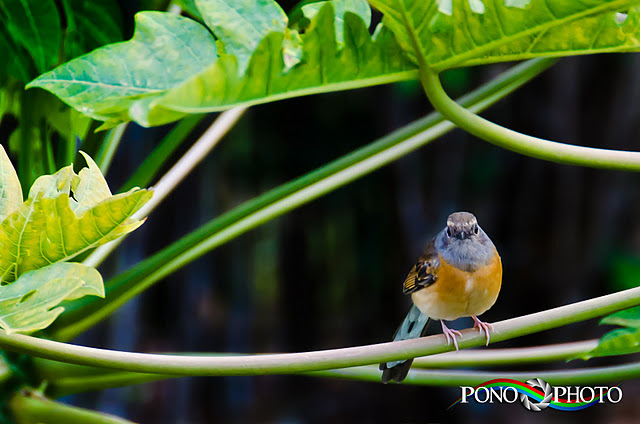 Being pono means not fighting what life gives you, and looking for the lessons. It means embracing that traffic jam because maybe it’ll make you late, and maybe because you are late and you are being pono, you will meet someone who can help you in some way. Maybe you just get to turn up the radio, and they play your favorite song, and you get the lift that you needed. This form of living pono shows up in Dan and my life on a regular basis, and this week, things have exploded. We have been writing and taking pictures, for very little money and sometimes nothing. We do it because we love it, we know that things will get better. We don’t try to map out what is going to happen, rather, we embrace the unknown and comfort ourselves by creating inspiring words and pictures. Just for the joy of it. Both of us have ideas for books that are slowly coalescing in our minds. A book is a huge project, and overwhelming to someone who has never done one. So far, I have two ideas, and Dan has one. John Wooten is one of my favorite farmers to cover. 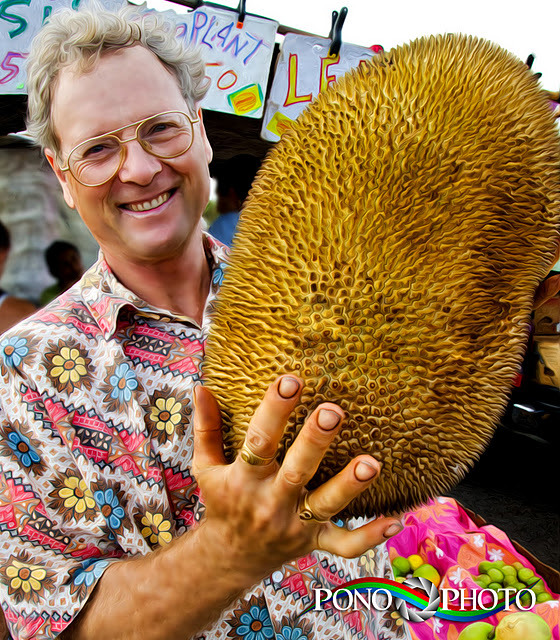 Here, he is posing with jackfruit. He is full of information, and passionate about sharing it with Kauai. In the meantime, we landed a big contract with the Kauai County Farm Bureau. It came to me because I was just doing my thing. Cooking ten meals for Larry every two weeks earned me not only money, but a friendship. Turns out Larry works for the farm bureau. 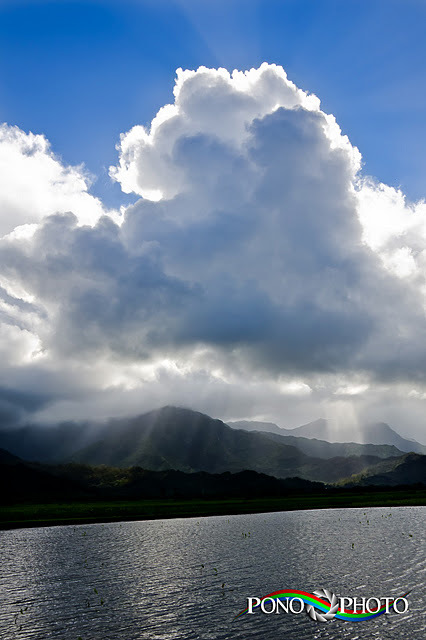 When his partner needed a writer for her Kauai Grown project, he recommended me. It seems that life wanted me to do this project. Another recommendation came from someone I’d never heard of. She has been doing work for the farm bureau and couldn’t take on any more. She also reads my weekly columns in MidWeek Kauai. 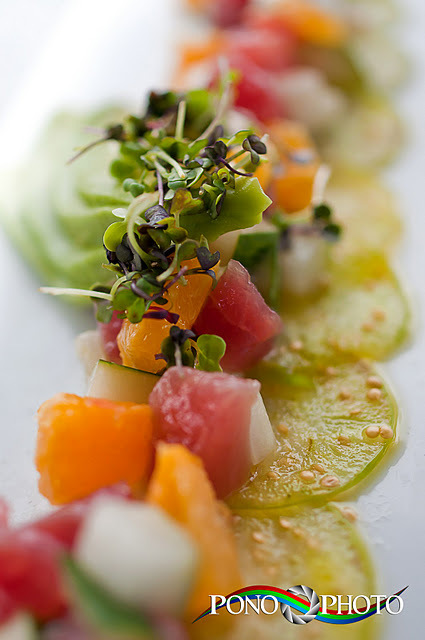 The Kauai Grown project is perfect for me because it celebrates local food. The website will go live in December with profiles of farmers, value added product makers, retail outlets and restaurants. To become a member, businesses have to use 51 percent local ingredients. I get to write about the students in the Culinary Arts program at the Kauai Community College. During their final semesters they cook food for their public restaurant. This week, it was on Chinese food. 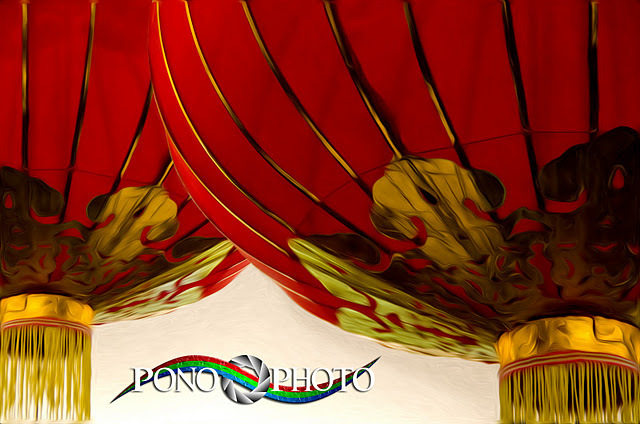 They decked the place out in lanterns and fans, and Dan got a great shot of these balloon lanterns. I met with Melissa, the woman who dreamed up Kauai Grown, over a slice of pie at The Right Slice. These are the best and most unique pies on the island, and I have covered them for MidWeek. It's ironic that Melissa and I are both local food supporters and we both ordered the Caramel Apple Pie. We were craving apples, because they don’t grow here, and we both agree that all anyone should do, is the best they can. Neither one of us is militant on the idea, but we are passionate about local food. At the time, Melissa wanted me to write an 80 word bio for each of the 30 members, and for Dan to take pictures. I told her that would be no problem, and since I do that every week, I already had the information I needed for one-third of the bios and Dan had the shots. As I told her about my background, she glommed onto the word video as soon as it left my mouth. These profiles will consist of a short video, text and five photographs for each member. Someone has already done most of the videos. Our agreement is 17 videos, 30 written bios and 150 photos (five for each member). Once the site launches, we will continue to do them as new members join. It looks like we’ll need to be purchasing a real video camera, as our consumer one isn’t going to work as well as we’d like. She has seen what our camera looks like and has heard the sound it produces. Since she is on a tight deadline (November 30) she is willing to go with what we have. If this turns out to be more work, we’ll buy another camera. In the last three days, Dan has sold shots to four clients. The Garden Restaurant at Common Ground bought his shots and put them on their website. Hula Baby Biscotti has asked for shots to put on a website that sells their product. Kauai Fresh Farms wants his shots for their website, and a friend is putting together an intimate dinner to connect farmers with consumers and wants shots for the flyer. This morning, Dan got hired to shoot cocktails for the Koloa Rum Company, plus there is more work needed down the line. These are all contacts we have made while doing MidWeek stories, which Dan has never gotten paid for. These folks have been seeing his beautiful shots every week and now, it’s paying off! Melissa also wants 20 prints, matted, for the Garden Island Food and Range Festival that’s happening next weekend. Besides the prints, Dan can upload all the shots to his website and these guys can buy and download the ones they want. And a check is directly deposited into our account! So you see, going pono is the only way to go! An Egret is naturally in the flow of life. Go! Fly like an Egret! Das right baby! Live da Pono! Amor de mi vida!